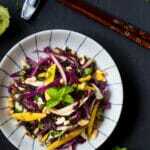 Fresh vegetables: green lettuce and/or crunchy veggies such as cucumber, kohlrabi, onion, cabbage and green papaya. Protein: chicken, beef, pork, small shrimp. 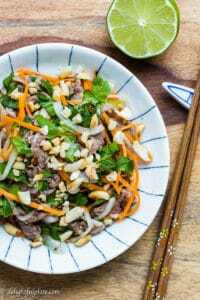 Sour and lightly sweet Vietnamese dressing: the dressing often consists of vinegar or lime juice, fish sauce, sugar, salt, and pepper. The ratio of these elements may differ according to one’s taste, but other than that there is almost no variation when it comes to salad dressing in Vietnam. I used to be fascinated that other cuisines have so many different types of dressing and vinaigrette. Fresh and vibrant green herbs: cilantro, mint, basil. Optional toppings: crunchy toasted peanuts, crispy fried shallots, toasted sesame seeds. As you can see, Vietnamese salads are like a symphony of different colors, different textures, and contrasting flavors. They are fun to eat, and every bite is full of surprise. The name of this salad describes how it is prepared. The beef is not cooked by heat, instead, it is sliced thinly, soaked in lime juice and chilled in the refrigerator. After 30 minutes to an hour (the amount of time depends on how rare you want the beef to be), it will be “cooked” by the lime juice acid. Yes, it is safe to eat and I hope you don’t get scared off by the cooking method of this recipe. However, I strongly recommend getting your beef from a good source. I always buy beef from my local farms, and I would not feel comfortable making this recipe with industrial beef. If you still feel uncomfortable, you can stir-fry the beef quickly in a pan after soaking it in lime juice. 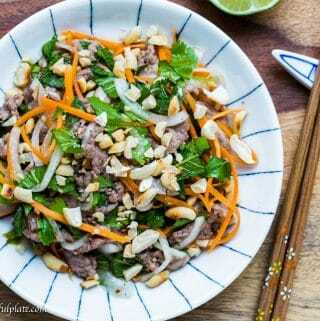 For bo tai chanh, it’s best to use lean cuts of beef and slice it thinly across the grain. You can leave the meat in the lime juice for longer than an hour but don’t leave it in there for too long because the acid in lime juice can make it mushy. 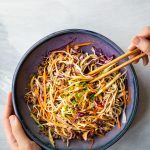 I like to make this salad in the summer because it’s very refreshing thanks to the lime juice and the aromatic herbs also enhances that freshness. The lime juice also removes any strong and gamy flavors from the beef. 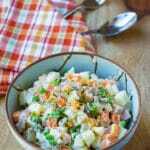 Besides, the salad can be enjoyed cold which is perfect for hot summer days. Slice the beef very thinly against the grain. In a bowl, mix it well with lime juice, garlic, sugar, salt and pepper. Cover and put in the refrigerator. Trim off the top and bottom of the onion, cut in half lengthwise and slice thinly. Mix it well with sugar and vinegar. Cover and put in the refrigerator. Peel and julienne the carrot and mix with sugar and vinegar. Cover and put in the refrigerator. Check the beef and give the beef slices a good stir in the bowl every 15 minutes to make sure they are all "cooked" evenly by the lime juice. After 40 - 60 minutes (more or less depending on how rare you like your beef to be), remove the beef, onion and carrot from the refrigerator, drain them and discard any liquid left. Put the beef, onion and carrot in a new clean bowl. Add all the herbs, fish sauce and sugar to the bowl and mix well. Adjust seasoning to taste. Transfer to a serving bowl, sprinkle toasted peanuts and enjoy! If you don't feel comfortable eating beef not cooked by heat, you can quickly stir fry your beef after soaking it in lime juice in step 5.